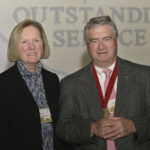 The Boards of Trustees for Southcoast Health System and Southcoast Hospitals Group periodically award its prestigious Southcoast Trustees’ Medal for Outstanding Service. 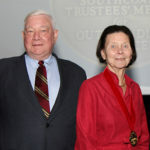 The Southcoast Trustees’ Medal is presented to individuals who have shown exemplary service, selfless giving and commitment to the goals and mission of the health system and hospitals. 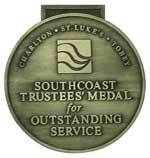 The Southcoast Trustees’ Medal for Outstanding Service is considered the very highest honor the Southcoast Boards can bestow — one that marks a lifetime of selfless giving and commitment to the health care of our communities. Jill has a very special relationship with Southcoast. She and her husband, George, have six children, so it’s no surprise that their relationship focusses on Southcoast Pediatrics. Jill began driving support and advocacy for Southcoast Pediatrics with a relatively modest party in her home in 2014. From that humble beginning, Jill’s passion, energy and enthusiasm have led to the growth of an annual fundraiser – The Fearons Celebration – that is now one of the biggest charitable endeavors in the south coast. Not content to promote Southcoast Pediatrics on just an annual basis, Jill now plans and directs a myriad of activities, from lemonade stands attended to by her children to Teddy Bear and Toy drives involving volunteers and merchants from throughout our community. This year, Jill added to her portfolio of fundraisers the Food for Tots program, where she brought together media partners and restauranteurs to direct publicity and donations to Southcoast pediatrics. All told, Jill’s efforts have raised hundreds of thousands of dollars for Southcoast Pediatrics. What truly makes Jill a gift to this community and this organization is not just the money that she helps raise. It is her amazing capacity for caring. Jill cares about every pediatric patient that walks through St. Luke’s doors and she has spent hundreds of hours as a volunteer baby cuddler. Jill cares that patients and families have a positive experience here. And Jill cares that we at Southcoast Health continue to work hard to provide our community with the best pediatrics program possible. Joanna and Christopher are siblings who come from a family whose commitment to Tobey Hospital dates back to when its doors first opened in 1938 and continues strong today. Their grandfather, John Crocker Makepeace, served on Tobey Hospital’s board and as the hospital’s first treasurer, while their father, Maurice Bursley Makepeace carried on the family commitment of board service for over three decades. Joanna and Chris have continued this unwavering commitment to giving. They created a family foundation in memory of their parents in 1998 and with grants from the foundation established an endowment at Tobey Hospital to ensure perpetual operating support for generations to come. Chris and Joanna extended their generous support with a major capital gift that established the Makepeace Center for Women and Families. Most recently, Joanna served on the planning committee for the Campaign for Southcoast Health, and she and her brother followed up with a capital gift for the upcoming renovation and expansion of the Tobey Emergency Department. While Chris and Joanna’s family legacy of giving is recognized throughout the Greater Wareham and Marion communities, their selflessness and modesty are what they are most known for. They, along with their extended family, embody the true spirit of giving; something that cannot solely be measured by dollars and hours of time given. The Trustees Medal was not awarded in 2016. 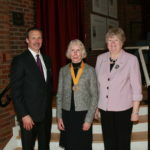 Elizabeth (Beth) Kunz began her service in 1995 when she joined the Tobey Hospital Board of Trustees at the urging of George Mock, a former board member who was then on the nominating committee. A partner in the firm Schaefer & Kunz in Mattapoisett, Beth served on the Southcoast Finance and Quality Committees following the merger in 1996 and has been a member of the Southcoast Hospitals Group Board of Trustees since 1999, serving as chair in the years 2009 through 2010, and then of the combined System and Hospital boards in the years 2012 through 2013. Over the years she has also served as a director of Coastline Professional Assurance Company, or CPAC, from its inception, and chaired the Finance and Quality Committees. In addition to her broad involvement in hospital functions, she, with her husband Randall Kunz, served as active participants on the Southcoast Centers for Cancer Care Campaign Planning Committee. Beth and Randall have generously supported every Southcoast capital campaign pre and post-merger and are 15-year continuous donors to the Southcoast Annual Fund. Always modest about their service and philanthropy, Beth and her husband Randall nonetheless set the standard for generosity and commitment. Bill Blasdale became a corporator of St. Luke’s Health Care System in 1990. In 1992, he was asked to participate in the Trustee in Training program at St. Luke’s and officially became a member of the board six months later. 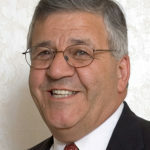 He was named to the Southcoast Hospitals Group Board of Trustees after the merger in 1996 and has served on the boards of numerous Southcoast entities and their related committees. Bill was chair of the board from 2002 to 2004. During his tenure, Southcoast completed a new surgical suite and intensive care unit at Tobey and began a major renovation and construction project at St. Luke and has served on the boards of numerous Southcoast Emergency Department. He has served on every Development and PR & Marketing committee since the merger. He has participated in the planning of, and generously supported, all fundraising initiatives for annual fund and capital campaigns. Bill has also played a significant role in influencing others to support Southcoast. The Trustees Medal was not awarded in 2013. Betty LaStaiti’s distinguished career began in 1968 — before she took the bar — when she became the first woman to graduate “First in the Class” from Boston College Law School. Judge LaStaiti worked in private practice in New Bedford for many years, during which time she served as Assistant Town Counsel for Dartmouth. Her service to our communities started early when she participated in the Bar Advocate Program, representing indigent defendants. She was appointed as an Associate Justice of the Bristol Division in 1988 and First Justice of the Bristol Probate and Family Court in 1994, retiring this year after 18 years of service. 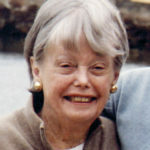 Betty has served as a Trustee of numerous Southcoast Health System entities, including as Chair of the St. Luke’s Hospital Board of Trustees in the 1980s and continuing in many roles after the Southcoast merger, most recently as Trustee of Southcoast Health System and Southcoast Hospitals Group and a member of numerous committees, including Board Quality and Community Benefits. Dr. Shapiro has been a fixture at Southcoast — and St. Luke’s Hospital before that — for almost 50 years. Dr. Shapiro joined St. Luke’s as an orthopedic surgeon in 1963 and still maintains a well-respected practice. Gil has served in many leadership roles during his tenure — from President of the Medical Staff at St. Luke’s to Chair of the Southcoast Health System Board of Trustees. Throughout the years, he has served as a trustee and served on committees too numerous to mention. There is almost nothing that Gil has not done for Southcoast and St. Luke’s! 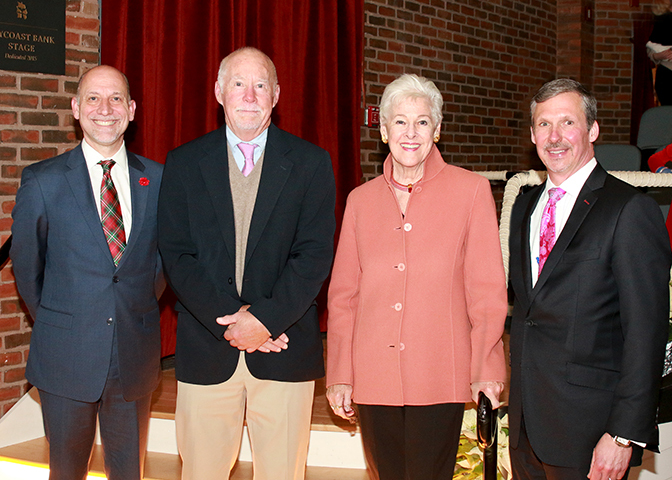 He has been equally dedicated to the philanthropic support of St. Luke’s and Southcoast. He has served on our Development Committee, assisted with many capital and fundraising campaigns, co-chaired the campaign to renovate the St. Luke’s Hospital Emergency Department and served on the Southcoast Centers for Cancer Care Capital Campaign Cabinet. With his wife, Frima “Timmy” Shapiro, they contributed the “Shapiro Healing Garden” — an extension of Southcoast’s “art and the art of healing” project and a spot that many find a welcome place of peace, just steps away from the busy St. Luke’s Emergency Department. Theodore Barth was an engineer working for the federal government during World War II when he and a partner invented the “bombing sights” which were installed on U.S. bombers. He was recognized as a great philanthropist in his lifetime and donated to many charities, but his most notable work was in support of Tobey Hospital, where he served as a trustee and as chairman of the board. During his lifetime, Mr. Barth’s gifts to Tobey Hospital totaled $500,000, but his support of the hospital has continued long after his death through grants from the Theodore H. Barth Foundation, which have donated $2.1 million and have made many renovations and updates possible at Tobey Hospital. This evening, The Barth Foundation is represented by one of its trustees, Dr. Ellen Berelson, whose father, Irving P. Berelson, was Theodore Barth’s lawyer and served as Vice President of The Theodore Barth Foundation until his passing in 1999. As trustees, we could think of no better tribute for Barbara, who has spent the last decade transforming the philanthropic landscape of our region by ensuring that our communities value and support Southcoast and our not-for-profit mission. 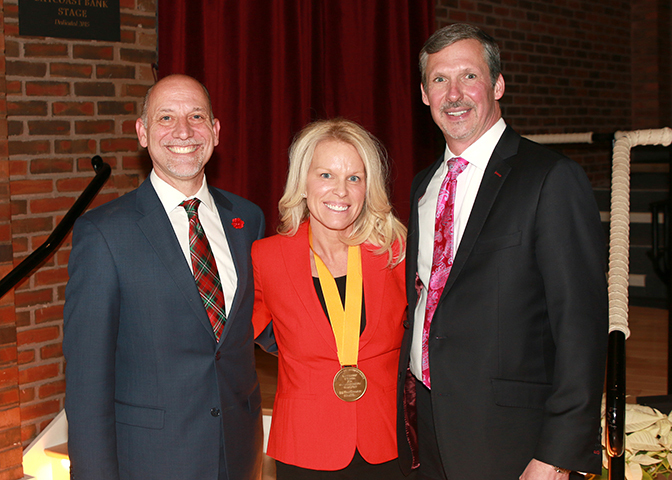 In fact, the very idea of our Trustees Medal for Outstanding Service was Barbara’s idea — a way to celebrate and honor those who gave selflessly of themselves for the betterment of our Health System and our communities. This describes Barbara — who has been a tireless advocate for community support. She has also been a tireless proponent of melding art with healing, building a program across the system that places donated art from local artists in our public spaces so that patients, visitors and staff can benefit from art’s healing powers. Barbara is truly a one of a kind, and we thank her for her incredible contributions to Southcoast and our region. The Manton Foundation was established by Sir Edwin and Lady Manton to support philanthropic efforts of interest to their family. Today, The Manton Foundation’s board consist of the Manton’s daughter and granddaughters, all of whom have strong roots in this region. Over the past four years, The Manton Foundation has made many significant contributions to a number of causes, including several that have benefited our local communities. Southcoast proudly counts itself among the fortunate recipients of The Manton Foundation’s largess. In 2007, The Manton Foundation provided the lead gift for Southcoast’s Digital Mammography Program, which led to the purchase of 13 digital mammography machines across Southcoast Health System. Last year, The Manton Foundation came through again and provided Southcoast with a $5 million grant to help complete the Southcoast Centers for Cancer Care. The grant is the largest gift ever received in the history of our hospitals and is strategic in its approach because of the challenge grant component associated with half of the gift. In fact, that $2.5 million challenge has already produced $1.8 million in additional donations! Elizabeth “Betty” Weinberg, along with her late husband, Sidney “Jim” Weinberg, have been decades-long friends and major supporters of Tobey Hospital and Southcoast Health System. Their support is legendary and continues through the next generation. Mrs. Weinberg has worked as a Volunteer Coordinator for the Patient Representative Program at Tobey Hospital and is a former Director of Volunteers at the Presbyterian Hospital in New York. In addition, Mrs. Weinberg has served as a Southcoast volunteer for many years as a member of the Southcoast Health System Development Committee and on the Capital Campaign Committee for Tobey Hospital. The Weinberg’s support of great local health care has benefitted thousands of patients across Greater Wareham and beyond. Ken Shwartz lives in Mattapoisett with his wife, June, and has served on the boards of many area non-profits. Ken is the third generation of his family to be in the “hat” business, following in the footsteps of his grandfather who ran a haberdashery in New Bedford in the 1920s. Some 75 years later, Ken formed his own business — Ahead Headgear — that designed ball caps and visors for golfers to sell to pro shops at golf courses. In 2000, Ahead Headgear was named the 11th fastest-growing private company in American on the Inc. Magazine 500 list. Through his company and many personal contributions, Ken’s support for Southcoast Hospitals and our communities runs deep — he has been one of our strongest supporters for more than a dozen years. The Trustees Medal was not awarded in 2010. The Trustees Medal was not awarded in 2009. The Lionbergers were honored, marking a lifetime of generosity to Southcoast Hospitals Group, starting in 1939 when Tobey Hospital in Wareham was first founded. Mrs. Lionberger volunteered each Sunday in the Tobey Emergency Department, and the two spent their holidays helping others. Often their philanthropic and personal support was given anonymously. Accepting for the Lionberger family were James Lionberger and his wife, Patricia of Marion. The service of the Jarabek family began when the late Allen Jarabek asked that an oncology endowment be created at Charlton Memorial Hospital in Fall River. Because of this generosity, oncology eventually expanded to include endoscopy services and, in 1992, the Jarabek Diagnostic & Treatment Center was created in the memory of Mr. Jarabek. Barbara Jarabek, Mr. Jarabek’s wife, has continues to support the center annually. The Jarabek Foundation has also provided funding for the Southcoast Health Van, Charlton’s digital mammography program, and The Goodspeed Chair in Patient Safety & Quality. Cindy Jarabek, their daughter, currently serves on the Charlton President’s Council. 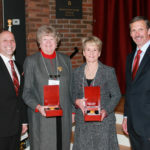 Accepting for the Jarabek Family were Barbara Jarabek, Allen Jarabek, Cindy Jarabek Audette and Jody Jarabek Oliviera. The Trustees Medal was not awarded in 2007. For 20 years, Betty Weinberg and her husband, Sidney, have been major supporters of Tobey Hospital, establishing a legacy that has had a significant impact on the Tobey of today. 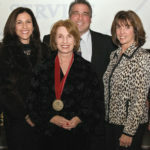 Weinberg used her early experiences at New York Presbyterian Hospital to create a volunteer Patient Representative program at Tobey in 1993. Her “hands on” attitude in supervising volunteers helped ensure that every patient’s issue or concern was compassionately addressed before discharge. She served on Tobey’s Board of Trustees, has been a tireless campaign member and today serves on the Southcoast Development Committee, offering valuable insight and direction for a stronger health system. 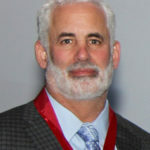 Robert Karam has served on the Southcoast Health System Board of Trustees since 2002 and is the first leader of Charlton Memorial Hospital’s President’s Council, which performs philanthropic outreach for the hospital. In that role he and his committee members raised more than $160,000 for the Southcoast Health Van and another $100,000 to support the purchase of digital mammography equipment. Karam constantly promotes Southcoast and its superlative health care to businesses and the community at large. He has raised the bar of philanthropy through his personal support and works tirelessly to ensure that Charlton continues to provide excellent health care in our community. One of Tobey Hospital’s strongest advocates for well over 20 years, Baldwin was chosen for her passion for quality health care, close to home, and her tireless effort to enlist the support of the community during Tobey’s last three campaigns. She served on the Southcoast Hospitals Group board from 1989 to 1995, seeing first hand how the merger that created Southcoast positively impacted what was once a struggling small community hospital. She most recently co-chaired the campaign to build Tobey’s new operating suites and intensive care unit — and it was her tenacity that helped the campaign far surpass its goal. She is someone who has always led by example. A devoted St. Luke’s Hospital patron for many years, Joblon’s continuous and outstanding support with special events has helped Southcoast raise thousands of dollars to help expand medical services, but has also provided many memorable evenings to Southcoast family and friends. Through her tireless efforts and dedication to detail, she has effectively informed our community of the need for philanthropy — and, more specifically, opened their eyes to the needs of their community hospital. A team player, she is always at the ready to get involved — and that makes her a special part of the St. Luke’s family. Earle P. “Chuck” Charlton II of Hillsborough, Calif.
Charlton has been a major benefactor, trustee, volunteer and a true friend to Charlton Memorial Hospital and Southcoast Health System for several decades. He represents and continues the legacy his grandfather started in Fall River over 100 years ago, beginning with the creation of Truesdale Hospital. He takes great pride in what his family has been able to accomplish and the impact their philanthropic endeavors have had on medical care in Southeastern Massachusetts. In his diligent role as a donor and advisor, he can always be counted on as a major Southcoast friend.